I mostly play PS4 games such as fortnite and call of duty. Have recently started twitching my games. To describe myself i love to joke and entertain while playing. Hi @burgerrangz! 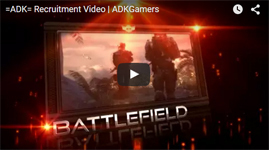 Welcome to ADK, hope to see you around, I'll check your channel out! Welcome to ADK! Do you ever play any PC games? Welcome to ADK! If you wanna play any PC games (fortnite is pretty good) hmu sometime!! Welcome to =ADK=, @burgerrangz! I hope to see you around on Discord and in game!